These combo grills are the most difficult to manufacture because it’s hard enough to make one great grill, so when you’ve been tasked with making two great grills, a huge number of things can go wrong. Especially, as people don’t really buy these huge combo’s for their portability, so functionality and quality are even more important. 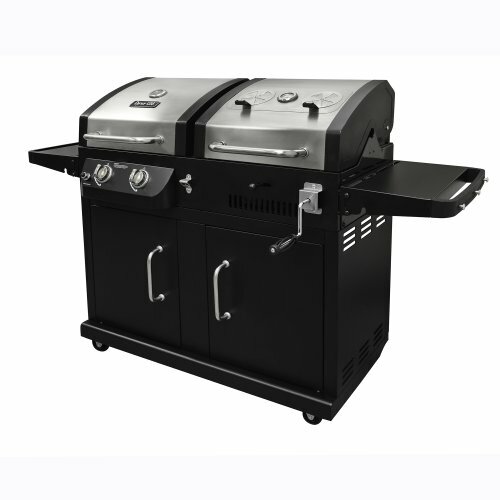 Nobody wants a top gas grill, attached to a charcoal grill, that is middle of the road at best, or vice-versa; so these grills tend to be hit or miss, with more misses, than hits, and buyers have become rather skeptical. I’ve decided to step in, and explain the features and benefits of one such combo grill, the Dyna-Glo DGB730SNB-D Duel Fuel Grill. I’ll be writing about actual performance, compared to company claims, and delving deeply into the hidden details behind the DGB730 so that you can work out for yourself, whether it’s worth a purchase. For a combo grill, the Dyna-Glo DGB730 is incredibly lightweight, coming in at only 92.6 pounds, where most combos will weigh in excess of 150 pounds, so you couldn’t ask for more in terms of weight. Added to this, they’ve also given buyers durability, by making the top, out of stainless steel, and when you look at the item, you’ll see that it’s a very sturdy, solid design, in a market of combo’s, which can sometimes be clunky. Its measurements are 68.5 inches of length, by 45.6 inches of width, and the height is 28.7; so it’s by no means small, but it’ll be easy to move into place, with the low weight, and the wheels. The assembly of the Dyna-Glo is a 30-minute job, and if we’re comparing this to the assembly of a small portable, it’s not that fast. But, compared to other large combo’s it’s quite special, because most of these grills require at least an hour of set-up time, even though 45 minutes is often quoted on the box. The manual supplied here is very good, and certainly helps with the assembly, so overall I think buyers will be happy with this aspect of the DGB730. Moving onto grilling food, and the kind of quality you should be expecting, the DGB730, is split into two sides, with the gas grill being on the left, the charcoal grill is on the right, and with the 940 square inches of cooking space being evenly split between the two, you have a very large surface, for up to 38 hamburgers on both. It gets full marks for space, and the grates are also top quality cast-iron. Cast-iron is the best metal to make grates out of because it holds heat well, and disperses heat very quickly, enabling the production of succulent, evenly tasting, juicy meats, of restaurant quality. Things just seem to get better when we add the commercial burners of the gas grill side to the equation, but it’s not all wine and roses, because here’s what the store staff aren’t going to tell you. On the gas side, the burners only distribute 24,000 BTU’s an hour, which is not very much, but the main problem is in the method of distribution, where buyers will notice, more than a hint of unevenness. So you’re not getting 24,000 BTU’s, evenly split over the hour, and this results in some messed up cook times. You really have to watch this grill, or things could go wrong. It’s such a shame because it could have easily been the best combo grill out there, especially as it has commercial standard burners with beautiful cast-iron grates. Instead, what you have is one of the best combo’s grills, that creates some amazing food, if you keep your eyes on it. The charcoal side is perfect, in fact, it’s nearly as good as the Performer Deluxe, and anyone who ever purchased the Performer will know how good that is. This is because charcoal grills are easier to manufacture, with the grates ultimately determining quality, while with gas grills, although grates can certainly save the day, they aren’t miracle workers, when dealing with bad BTU distribution. Onto cleaning; the DGB730 is porcelain-enamel coated, so you won’t be scraping debris from the grates until the sun goes down, and generally, you can clean with one wipe. Reading the box description and looking at the grates, you could easily think that this is the best combo grill available. You’d be right on the charcoal side, where the grates ensure amazing food, and on the gas side, you’ll get food that’s up there with the best. But, the heat output from the burners is incredibly uneven, so if you don’t keep watching, you’ll end up with either burnt or underdone food. Outside of this, there are 940 square inches of space, an excellent design, and the price is lower than most combos, so I’d recommend this to anyone, despite the flaws.